At the corner of U.S. Highway 17 and State Road 40 in Barberville, giant chickens mingle with toothy dinosaurs while a massive giraffe stands guard over a market full of twisted metal and fresh produce. You might think this is a plot to some whacked-out B-movie from the 1950s, but it’s actually just another day for Carlos Pendola, the owner of Barberville Roadside. 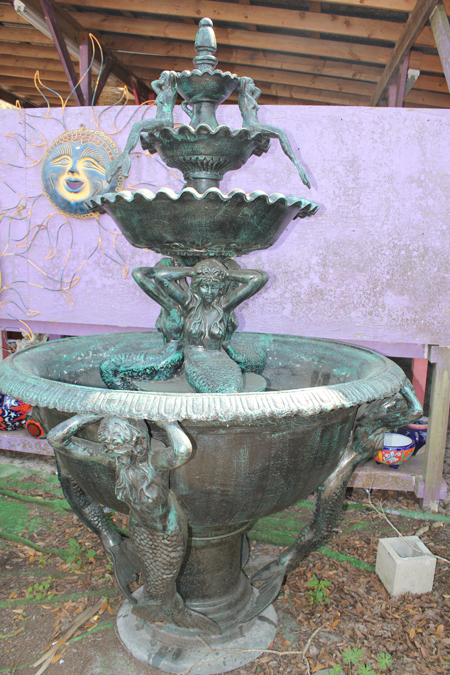 For more than 20 years, the roadside attraction has been selling the rare and unusual. Originally opened by David Biggers in 1990, the shop was sold to Pendola, a former Miami car dealer, eight months ago. Though his new career is much more laid back than the car business, Pendola still endured some growing pains. He remembers going to a wholesale show with Biggers who tried to dissuade him from buying a cache of watches. Since then, Pendola has stuck to the shop’s four basics: produce, handmade recycled metal art, furniture and Mexican Talavera, a hand-painted type of pottery. 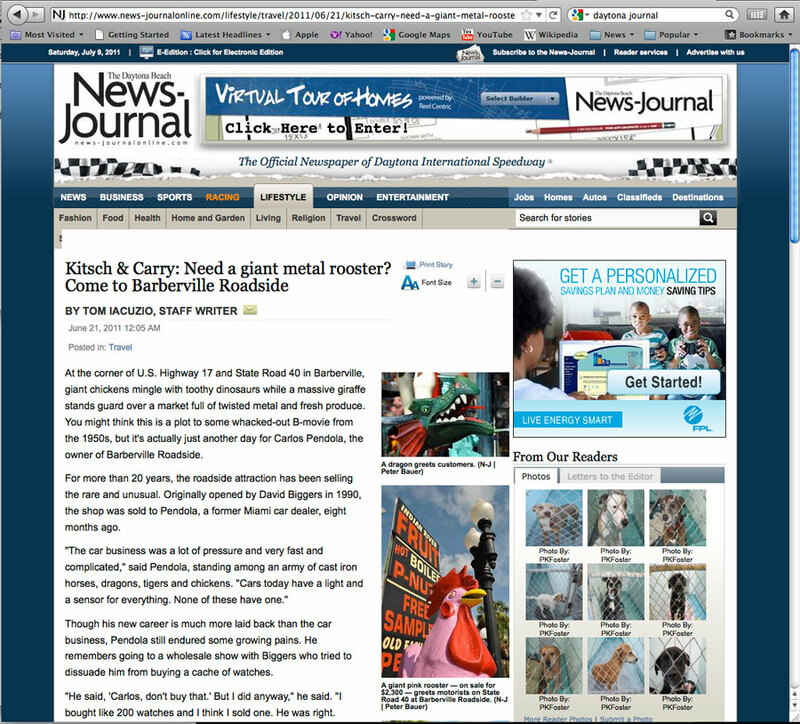 But the bread and butter for the Barberville establishment is still the unique pieces of metalwork. And don’t worry, Pendola won’t mind if you call it junk. While $5,000 for a fountain or $5,300 for a giant dinosaur might sound pretty steep, the lack of competition makes it hard to argue with the price. “Someone might say something in here is expensive but compared to what?” asks Pendola. What keeps the customers buying the odd items isn’t necessity, says Pendola, it’s desire and emotion. And while 67-year-old Barbara Harrison of DeLand wasn’t in the market for a giant chicken, she found herself drawn in by it just the same. It’s that kind of reaction that keeps Pendola from spending any money on advertising. “Our storefront is advertising,” he said. But even with all the big-ticket items out on the roadside, Pendola says he’s had no issues with theft. In fact, he says there may be an upside to it, referring to an incident that occurred under the previous owner. That’s just one of the aspects of the business Pendola hopes to continue with the 22-year-old establishment. And as he continues to sell dreams to his customers, Pendola says he has a few of his own. It’s not everyone that needs a 10-foot ceramic rooster, but it’s nice to know you can find one in a pinch. 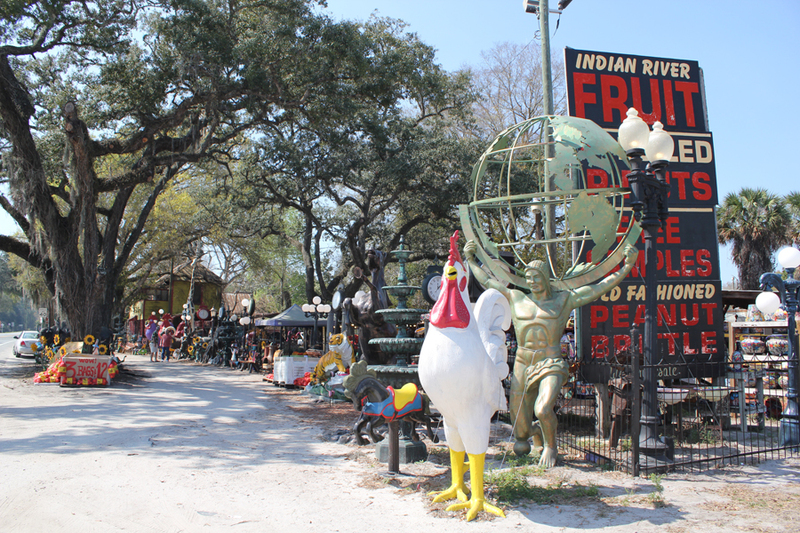 The phenomenal fowl is the iconic image at Barberville Produce, a two-acre menagerie of oddities in wrought-iron that renders such a humble name inadequate. Standing at the corner of U.S. Highway 17 and State Road 40, along one of Central Florida’s most traveled rural roadways, the stand does stock peanuts and honey, but it’s bizarre big ticket items that have kept it in business for almost 20 years. Cast-aluminum Clydesdales, buffalo, bears, lions and alligators are silent sentries in the dirt, as if it’s like its the boarding area for Noah’s Ark. They beckon drivers to stop and maybe buy a giant street lamp, scale-model of the Statue of Liberty or some other kitschy collectible that would qualify as the ultimate impulse purchase.